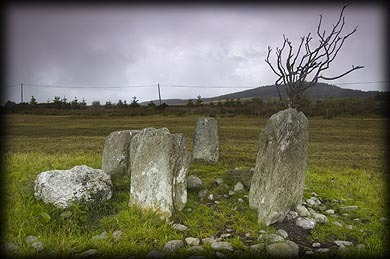 The five stone circle at Lettergorman south west consists of thin slab like stones, the thickest stone is the very flat topped recumbent located at the south west of the circle, it is about 1.5 metres in length by 1.4 metres high and just over a metre thick. The tallest stones are the portal stones, one of which lies prostrate the other stands about 1.6 metres tall. 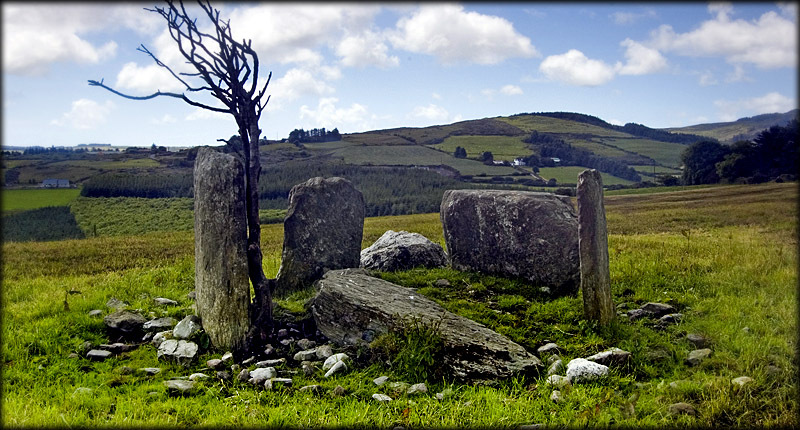 Lying next to the circle is a large block of white quartz that may have been an outlier to the south west of the circle in alignment with Carrigfadda Hill. Scattered around the circle are lots of small stones which are field clearance. As I was visiting this circle the weather suddenly took a turn for the worse, so I had to abandon a visit to the nearby 'Four Poster' at Lettergorman north. Situated: From Ross Carbery take the N71 west to Connonagh then turn north to Reanascreena, after 2k keep left at the fork and after a further 2 1/2k keep sharp left at the next fork. Approximately 1k up here the Maulatanvally circle can be seen in the fields to your right. Drive by here and after another kilometre you will see the circle in the field to your right. Approach from the lane to the north. Discovery Map 86, 89: W 2617 4564. Last visit May 2007.